Are there any madsonic or subsonic clients for IOS which block / stop caching if / or don't allow caching? I want to have a client that streams playlists but restricts copying of files for offline playback. My goal is to restrict Isub from being able to cache. I have isub running on an iPod at a restaurant. I don't want the staff there whom have access to the iPod, to be able to cache all the files played and potentially copy all the music. 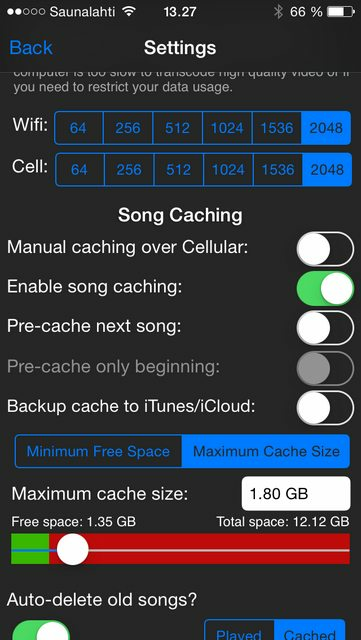 Enable song caching -> Off? Maximum Cache Size -> 0? This feature I see in Isub, however is there a way to make it so whoever has access to the mobile device, can not then change those cache settings? Is it possible to block caching via there Madsonic settings on the server? From the server side it is not possible. Client hadless the caching completely. For your luck there is app named Audiophone for iOS.